Restricted Application added a project to T3181: Ruleset "apply for" seemingly does nothing: GUI/HUD. Restricted Application added a project to T3180: Ruleset some values need different input control: GUI/HUD. Restricted Application added a project to T3179: Ruleset remove buttons need confirmation: GUI/HUD. Restricted Application added a project to T3177: Enter does not confirm for any input control: GUI/HUD. Restricted Application added a project to T3176: Ruleset input values cannot be longer than 10 characters: GUI/HUD. Restricted Application added a project to T3175: Ruleset name value table has no fixed sorting: GUI/HUD. lancake raised the priority of T3174: Ruleset menu buttons are disabled/enabled with the wrong selection from "Normal" to "Pre-Release Quality Assurance". Restricted Application added a project to T3174: Ruleset menu buttons are disabled/enabled with the wrong selection: GUI/HUD. lancake set First occurrence (version) to 0.201.3xx on T3173: Resizing Ruleset menu goes out of bounds. Restricted Application added a project to T3173: Resizing Ruleset menu goes out of bounds: GUI/HUD. lancake created T3173: Resizing Ruleset menu goes out of bounds. Restricted Application added a project to T3172: Removing rule does not wipe all fields: GUI/HUD. Restricted Application added a project to T3159: Build mode panel feedback/bugs: GUI/HUD. Restricted Application added a project to T3158: shield recharge below upkeep message spams during combat: GUI/HUD. Restricted Application added a project to T3157: applying any graphical option change causes crash: Engine. Restricted Application added a project to T3156: map is incomplete when looking at unexplored systems: Galaxy Map. lancake renamed T461: missiles and beams don't deal damage to planet cores from "missile and damage pulse explosions don't deal damage to planet cores" to "missiles and beams don't deal damage to planet cores". Restricted Application edited projects for T3066: Missile Weapon bug, added: CBS: Weapons; removed Issue Navigation. lancake merged T3066: Missile Weapon bug into T461: missiles and beams don't deal damage to planet cores. lancake changed the edit policy for T3066: Missile Weapon bug. lancake claimed T3066: Missile Weapon bug. Duplicate task, rechecked and beams also go through the planet core and apply no damage. Merging tasks together. lancake closed T3072: FBO INIT error on world load as "Closed". lancake changed the status of T3072: FBO INIT error on world load from "In Queue" to "Resolved". lancake changed the status of T3072: FBO INIT error on world load from "Open" to "In Queue". lancake changed the status of T3065: Entity despawns when rail it is docked to is removed from "Open" to "Feedback". lancake set First occurrence (version) to 0.201.126a on T3065: Entity despawns when rail it is docked to is removed. lancake moved T3065: Entity despawns when rail it is docked to is removed from New / Unconfirmed to Feedback on the Issue Navigation board. lancake claimed T3065: Entity despawns when rail it is docked to is removed. Can't reproduce, removing the rail docker and/or the rail turret axis does not influence the entities for me. As expected, their rail functionality is still OK, and all entities were solid + did not disappear. Are you able to reproduce this consistently, or was it a one time occurrence only? It's also possible it was fixed since that version, or that this is an old but rare issue that is now easier to notice. lancake edited Tester information (Internal use only) on T3064: remote turret control non functional. lancake renamed T3064: remote turret control non functional from "Manual Turret Control non functional." to "remote turret control non functional". lancake changed the status of T3064: remote turret control non functional from "Open" to "In Queue". lancake moved T3064: remote turret control non functional from New / Unconfirmed to Confirmed on the Issue Navigation board. Remotely firing newly loaded turrets does not fire them, they still track your mouse cursor though. As soon as the turrets received a target to shoot at, with either 'selected target' or 'any' with pirates nearby, then you can fire the turrets remotely as well. However, the projectiles will not go to your mouse cursor, but instead to the last position of the target it was set to before you took control with the rail turret axis. lancake renamed T3060: Stabilizer stream with simple shader is off in scale and position from "Stabilizer Beam is off" to "Stabilizer stream with simple shader is off in scale and position". lancake changed the status of T3060: Stabilizer stream with simple shader is off in scale and position from "Open" to "In Queue". Good find. Disabling the advanced energy beam shader option gives you the simple version, but this one also is off in scale and position is off. Seems to be by a factor of 2. SpaceKing awarded T390: power failure keeps ship in power failure including power inheritance a Pirate Logo token. lancake changed the status of T3048: Missiles fired cross sector bypass shields from "In Queue" to "Resolved". lancake changed the status of T3062: Critical Error when loading worlds/servers from "Open" to "Feedback". This may prevent the crash from happening, so only do this after you uploaded that log file since we need that to provide a real fix. lancake raised the priority of T3062: Critical Error when loading worlds/servers from "Normal" to "Urgent". lancake claimed T3062: Critical Error when loading worlds/servers. Can you upload your logstarmade.0.log file? It's located in your StarMade/logs folder. Drag and drop the file into phabricator's text box to upload it here. lancake merged T2945: game crashes on exit of Builder block into T3040: Crash on exit from build block. Restricted Application removed a project from T2945: game crashes on exit of Builder block: Issue Navigation. lancake changed the edit policy for T2945: game crashes on exit of Builder block. lancake claimed T2945: game crashes on exit of Builder block. Should be fixed now, merging tasks. lancake changed the status of T2941: Stabilizer group detection from "In Queue" to "Resolved". lancake changed the status of T2941: Stabilizer group detection from "Open" to "In Queue". lancake changed Last tested (version) from 0.201.089 to 0.201.105 on T3040: Crash on exit from build block. lancake closed T3040: Crash on exit from build block as "Closed". lancake changed Last tested (version) from 0.201.089 to 0.201.100 on T3039: Missile lock stays when switching slots. lancake closed T3039: Missile lock stays when switching slots as "Closed". lancake changed Last tested (version) from 0.201.090 to 0.201.100 on T3037: Actual stealth strength does not increase from chamber strength upgrades 2 to 3.
lancake closed T3037: Actual stealth strength does not increase from chamber strength upgrades 2 to 3 as "Closed". lancake closed T3009: Cannon projectiles on planet core causes crash as "Closed". lancake closed T3008: Cannon-Missile weapon draws no power as "Closed". lancake changed Last tested (version) from 0.200.335+ to 0.201.115 on T3002: Recoil Intensifies under certain scenarios. lancake closed T3002: Recoil Intensifies under certain scenarios as "Closed". lancake changed Last tested (version) from 0.200.323 to 0.201.115 on T2838: Beam texture doesn't go away after overheating..
lancake closed T2838: Beam texture doesn't go away after overheating. as "Closed". lancake closed T2823: Power stream doesn't get removed if you delete power reactors instead of the stabilizers as "Closed". lancake closed T2806: Stabilizer path is green in certain situations as "Closed". lancake closed T2806: Stabilizer path is green in certain situations, a subtask of T2803: Perfectly vertical stabilizer path can't be hit, as "Closed". lancake closed T2796: Block preview rotation tooltip is obtrusive as "Closed". lancake closed T2868: Beams don't do the same DPS as "Closed". lancake changed the status of T3061: Chunks Vanishing (permanently) from "Open" to "Feedback". lancake claimed T3061: Chunks Vanishing (permanently). I've encountered reverted chunks in some of the blueprints I did, that seemed to have fixed itself after using Clear client cache in the main menu - tools. It's still an issue but I can reproduce it somewhat which is good. lancake renamed T3048: Missiles fired cross sector bypass shields from "Cannons and Beams bypass shields" to "Missiles fired cross sector bypass shields". lancake changed the status of T3048: Missiles fired cross sector bypass shields from "Feedback" to "In Queue". Perhaps at the start it was mainly cannons and beams going through the shield due to the bug of T2849. That still appears to be working fine, but the remaining hull damage I saw happen was caused by missiles fired from a different sector than the shield group/entity was in. lancake changed the status of T3040: Crash on exit from build block from "Open" to "Resolved". You had a few more HUD context options enabled than I did. But it's fixed either way as Schema went through them all to check for any possible mistakes (and fixed some that may have caused it). Your settings are fine though, didn't see anything odd in it besides the extra HUD Contexts you had enabled. lancake added a comment to T3032: Warp Gate Distance Displays Incorrectly. lancake changed the status of T3040: Crash on exit from build block from "Open" to "Feedback". 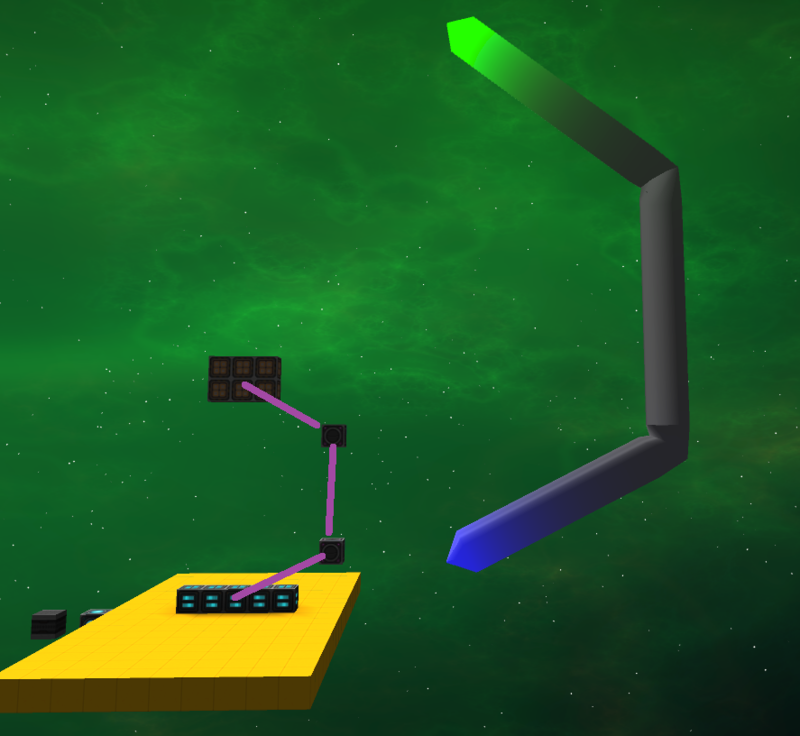 lancake added a comment to T3040: Crash on exit from build block. I should have tried your settings.cfg sooner, but using yours seems to cause it indeed. Thanks for sharing that world but it seems the files are incomplete. It only contains the npcFactions, where as your world should also contain a DATA and index folder. lancake changed the status of T3048: Missiles fired cross sector bypass shields from "Resolved" to "Feedback". lancake added a comment to T3048: Missiles fired cross sector bypass shields. Could you upload the blueprint of the ship you used? I can't reproduce it with my own ships, visited a random pirate station and fought a few NPC ships as well. Maybe I got lucky or it's something specific to the ship. lancake added a parent task for T3048: Missiles fired cross sector bypass shields: Unknown Object (Maniphest Task). lancake changed the status of T3048: Missiles fired cross sector bypass shields from "Open" to "In Queue". Those issues should be fixed, shield should report its percentage more accurate now and any shield bypass should also not happen anymore. Could you give it another check? It seems to work fine for my setup where I could reproduce it before. lancake closed T3038: Missile computers facing don't cause missiles to be launched downward as "Rejected". Alright, I'm assuming you accidentally rotated it with that debug command. That or the issue got fixed along the way, thanks for checking it again! lancake changed the status of T3044: AI Turrets dont shoot with B and BM (Beam-Missile) from "Open" to "Feedback". lancake changed the status of T3025: Tractor Beam Jitter from "Open" to "Feedback". lancake changed the status of T3024: Tractor Beam crash from "Open" to "Feedback". Unfortunately I'm unable to reproduce the issue following those steps to the letter. Anything you did after the "Create a station" step that you forgot to mention? Even trivial stuff like connecting a factory to something could be a cause. lancake changed the status of T2988: Loaded Entities Stabilizers Not Working from "Open" to "Feedback". lancake changed the status of T3026: Pasting old blocks from "Open" to "Feedback". Restricted Application added a project to T3059: Volley fire rate does not adjust to new weapon reload: CBS: Weapons. lancake lowered the priority of T3058: Some blocks are no longer placable/don't show up in creative inventory from "Normal" to "Low". lancake closed T3058: Some blocks are no longer placable/don't show up in creative inventory as "Rejected". Rod lights use normal block lights as source block. Using the give command allows you to get those blocks straight up but they're not meant to be used like that anymore. lancake raised the priority of T2955: maintain clic mouse make Salvage beam firing continually. from "Normal" to "Pre-Release Quality Assurance". lancake closed T2955: maintain clic mouse make Salvage beam firing continually. as "Rejected". Fixed by now, it's meant to do this but the power consumption was incorrect. lancake raised the priority of T2952: Firing multi-output missiles without enough capacity causes crash. from "Normal" to "Pre-Release Quality Assurance". lancake closed T2952: Firing multi-output missiles without enough capacity causes crash. as "Rejected". Restricted Application added a project to T2951: Ships cannot be edited in build mode while docked. : CBS: Rails. lancake closed T2951: Ships cannot be edited in build mode while docked. as "Rejected". lancake raised the priority of T2980: Docking Module beam missing? from "Normal" to "Pre-Release Quality Assurance". lancake closed T2980: Docking Module beam missing? as "Rejected". lancake set First occurrence (version) to 0.201.005b on T2981: in 0.201.005b docked entities don't move on basic rail and rail rotator..
lancake closed T2981: in 0.201.005b docked entities don't move on basic rail and rail rotator. as "Rejected". All of those issues were fixed now. lancake renamed T2977: cannon shot passes through docked entity from "Dev release cannon shot passes through docked entity" to "cannon shot passes through docked entity". Restricted Application edited projects for T2977: cannon shot passes through docked entity, added: CBS: Weapons; removed Issue Navigation. lancake merged T2977: cannon shot passes through docked entity into T3017: docked entities take no cannon damage. lancake raised the priority of T2977: cannon shot passes through docked entity from "Normal" to "Pre-Release Quality Assurance".